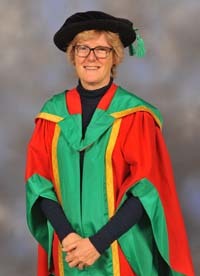 Honorary Degree of Doctor of Science in recognition of her outstanding contribution to the development of medical research strategy and leadership in the health professions. The first woman to become England’s Chief Medical Officer - in 2011 – was previously consultant haematologist at the Central Middlesex Hospital, and professor of haemoglobinopathies at Imperial College London. Dame Sally qualified as a doctor at the University of Manchester in 1972. She went into research in blood-related conditions because she believed that patients with sickle cell anaemia, mainly from black communities, should be getting better treatment. As CMO she fosters widespread NHS research and development through the National Institute for Health Research that she established. Dame Sally is involved in several bodies concerned with global health research, including the World Health Organisation Executive Board. She is also Chief Scientific Adviser to the Department of Health, and has been prominent in the action to tackle the ebola virus. She was honoured in 2009 with a DBE for services to medicine and Fellowship of the Royal Society in 2014.